A beautiful, hand carved, French marble fire surround, dating to C.1850-1860. The fire has an interesting provenance and was removed from the prominent Dudley Ward family house in Park Lane, London. The fire was sold at auction in Surrey in 2015 and has been kept in storage. 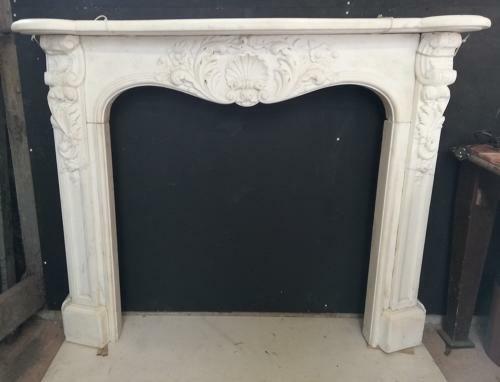 The fire has been made of statuary stone, the finest carrara marble, and has stunning carved designs featuring a central design with a large shell and acanthus leaves. The legs have decorative corbels and acanthus leaf design. The mantel has an attractive serpentine edge. The marble hearth is included with the fire surround. The fire is heavy and imposing and would look stunning in a living or dining room and paired with a fire basket or wood burner. The fire is of a very fine quality but is antique and has had some significant, repaired, damage. The middle of both legs have had repaired breaks and there has been a repaired break to one corner of the serpentine mantel. There are some chips to the back of the mantel and joints and there are some further filled and repaired chips and knocks. There are some light scratches, marks and stains. The fire surround has a fantastic history and beautiful design, and would be a stunning feature within a home. Mantel width (at back) 141cm approx.